The new Ratings Calculator is here! Horse racing today is more complicated than ever with racing on 364 days of year 2016. To work through all that racing you need a tool. That's right. A tool to simplify the job and select the best chances in the race. The Pureform Ratings Calculator gives you this ideal framework to formulate fantastic value packed quinella, trifecta and first four combinations. The beauty of the Pureform approach is when you get that elusive result it pays big! 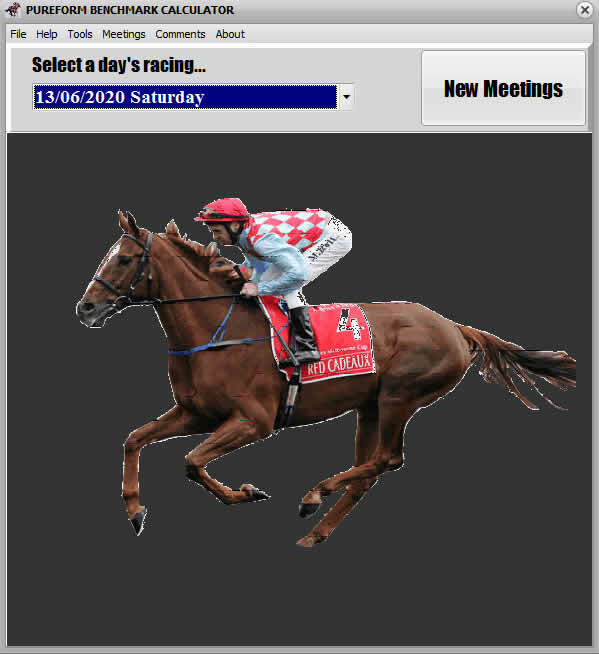 This version 2 product not only gives you every start and ratings for every single run but it automatically produces Dutch Book market ready for overs punting, multiple betting or simply support the top pick or two. And from the ratings, value is built in guaranteeing some huge potential collects. Looking for big results? Did you get the First Four in the last race in WA last week? The program has many times. Did you miss that huge overs winner that no one else had? The program didn't. No other product offers these features in one handy package at a budget price and ready to go with a click of a button. Class ratings have been used in horse racing for many years, it's nothing new. Why create something new? T he value is still there in win and place bettting, not as good as before in the multiples but value can still be found. Ratings point to clear cut winners in many events and are a great starting point in others. At the other end of the scale, that poorly handicapped runner is quickly highlighted with figures in black and white. The new computer program uses base ratings for the various classes and from these, past ratings are calculated. Use these ratings or your own if you want, adjusted for weight, barrier, jockey and any other factors automatically calculate a completely flexible market. Produce your own market (any percentage and market-type) or simply follow the finish order and prices as automatically calculated. You don't need to do another thing if you just want to follow the system.